The Adina Mosque at Pandua was built in 1375 by Sultan Sikander Shah, the second sultan of the Ilyas Shahi dynasty. At the time of its construction it was the largest congregational mosque in South Asia and reflected the power and wealth of the sultan. The mosque comprises as large 'sahn' or courtyard, enclosed on three sides by arcaded cloisters, and on the fourth by a covered sanctuary with a high central bay at its centre. The sanctuary interior is decorated with panels of black basalt carved with calligraphic inscriptions and non-calligraphic surface ornamentation. 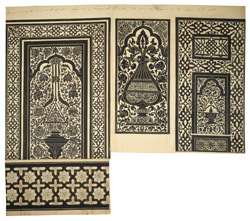 These complex designs include geometrical patterns, vegetal motifs, rosettes and abstract arabesque designs. This drawing shows a series of designs probably taken from a number of the many 'mihrabs' or prayer niches in the sanctuary interior. These are placed at intervals along the directional wall or 'qibla' that indicates the direction of prayer towards Mecca. The central motif in the outer two is a lamp and chain, a design often considered to be symbolic of the divine light of Allah. The central design comprises an elaborate vase within a cusped arched motif.